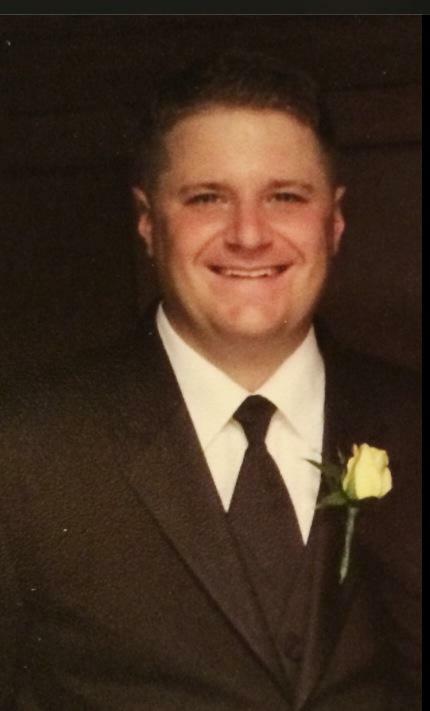 Thomas B. Wallace, 37, a resident of Milford for the last 6 years, passed away Thursday, June 4, 2015, surrounded by his family, at the Rose Monahan Hospice House in Worcester. Son of Edward J. and Patricia A. (Krohl) Wallace of Milford, he was a 1995 graduate of St. John’s High School in Shrewsbury, a 1996 graduate of Bridgton Academy in North Bridgton, ME, and attended St. Michael’s College in Burlington, VT. Husband of Sherry A. (Welch) Wallace, Thomas had worked as a senior safety coordinator with Genzyme in Cambridge, MA for 7 years. Tom was an avid golfer, who loved sports, the Bruins, Syracuse basketball, and his family. In addition to his wife and parents, he is survived by his children, Giana K. Wallace and Thomas B. Wallace Jr. of Milford, his sister Kathryn M. Karmelek of Mendon, his brothers, Patrick J. Wallace of Milton, GA, and Timothy D. Wallace of Atlanta, GA, many aunts, uncles, cousins, nieces and nephews. His funeral and mass of Christian burial will be held on Tuesday, June 9, 2015 at 10 A.M. at the St. Mary’s of the Assumption Church on Winter St. in Milford, with his burial to be held at a later date. Calling hours will be held at the Consigli-Ruggerio Funeral Home at 46 Water St. in Milford on Monday from 4 to 8 P.M. In lieu of flowers, contributions for Tom's children may be sent to Jason Karmelek, custodian, 3 Joseph Rd., Mendon, MA 01756. Upon my arrival at St. John's HS, Tommy was the first one to welcome me to the school and to the Pioneer hockey team. A good teammate, a better friend and an amazing person. Gone to soon- God Bless you and rest in piece, Tom. A great man who left a lasting impression on many! May peace find his family and friends during this time of sorrow. God bless. I am so sorry for loss. It was my honor to teach and coach Tom. A great man from a great family. My thoughts and prayers go to Tom's family, friends and former teammates. Gone to soon. Tom was such a wonderful man with an amazing heart. His laugh was infectious and adored by many. We will miss you Tom but you will forever be in our hearts. My condolences to you all. I am so very sorry for your loss. He sounded like a wonderful man. Thoughts and prayers to the Wallace family. Love, thoughts, and prayers for Tom and both families. Wishes for fond memories and brighter days ahead with Tom as an inspiration. God rest his soul. I am praying for the entire Wallace family. I am privileged to have known Thomas as a friend, teammate, and so very much more. Tom did everything first class. Tom did everything right. I am truly going to miss you, Tommy Boy, I am comforted knowing that you are at peace now. Tom Wallace always put the puck on your stick, tape to tape, on the ice and off. Love always. My condolences to all the Wallaces. Tom was an amazing person who I am lucky to have called my friend. I will hold all the memories close to my heart. To the family, stay strong and Tom, may you be at peace. Sherry,Gianna and Tommy along with your families. I send my deepest condolences to all of you. It was a pleasure to know Tom while being Gianna and Tommy's daycare teacher. Tom was a very dedicated father who loved his children and his wife. You are all in my thoughts and prayers. Sherry, Giana and TJ......my heart aches for the life you've all been forced to deal with for so many years. Sherry - you have been one of the strongest wives and mothers I will probably EVER KNOW! I know you've had some help from your family, friends etc., however, I KNOW FIRST HAND what you've had to deal with over the past several years as Tom's condition became increasingly worse. Despite how bad it got YOU found the strength to push through to another day. Caring for 2 small children while working a full time job and caring for Tom wasn't easy and I'm sure that at times you will miss all the madness if only to see him one more day! Giana and TJ are 2 very lucky kids to have such a strong woman as their leader in life. I love you truly and will always be here for you - no matter what. Couldn't have picked a better guy to watch and learn from during my younger days. Always had a smile and ready to share a laugh. God bless you Tom you will be missed by many. Thoughts and prayers to the entire Wallace family. Tommy, such a great, selfless person. I always looked up to you, on and off the ice. Heaven is lucky to have you. Patty and Family, My deepest sympathy to you at this time. You are in my thoughts and prayers. May God grant you peace and comfort in your time of sorrow, and keep Tommy's spirit and love in your heart always.